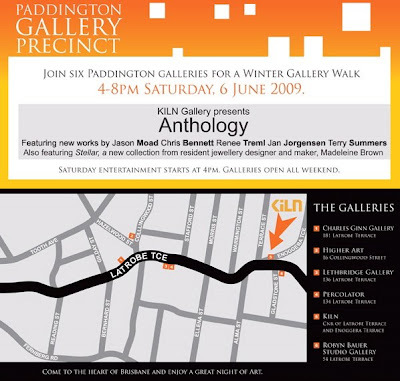 Join us in Paddington next weekend for the Paddington Gallery Precinct Walk. Twice a year, our whole string of galleries has a big joint opening. It’s a great way to catch up on all the spots you’ve been meaning to check out… but have never quite got there. I love Paddington so much- we lived there for a long time before succumbing to the lures of the bush. She does get a bit quiet at night, though. So I always love the night of the Gallery Walk- Latrobe Terrace fills up with art-loving revellers wandering up and down the street. The gallery that hosts my studio, Kiln, is having a showing of some of our favourite artists: Jason Moad, Jan Jorgensen, Renee Treml, Terry Summers, and Chris Bennett. And you’ll also get to see a new range of silver and gold jewellery I’ve been working on… you’ll get a sneak preview soon, promise! oh my oh my oh my. sounds like the most perfect date. I am so there!